If you’re into Zelda theorizing, then it’s quite likely that you’ve seen the Gametrailers Zelda Retrospective. This article will be focusing on the sixth and final installment of the series: Gametrailers’ attempt to piece together the Zelda timeline. Gametrailers does a good job at presenting the theory in a way that keeps the attention and interest of the watcher, and the video can seem quite convincing. Many people who are new to the concepts of Zelda theorizing and are searching for some answers readily accept the Gametrailers timeline as a plausible answer. However, when logic is applied, it becomes apparent that Gametrailers has made some critical mistakes. Now, let’s get into their explanation of the timeline. After talking about the creation of Hyrule, as told in Ocarina of Time, the video shifts to the story of the Hero of Men. The tiny Picori appeared from the sky, bringing the hero of men a sword and a golden light. There are some pretty significant differences here. Gametrailers claims that the Picori ended a war between the races of Hyrule who were fighting over the Triforce. The Minish Cap states that the world was on the verge of being swallowed by shadow, and that the Picori intervened to save them. Gametrailers phrases it in such a way that it appears the Picori have been living among the races. The Minish Cap says they “appeared from the sky” and gives no implication that they were there before. No mention is made of Gustaf in The Minish Cap‘s introduction, and no where in the game is he said to be the Hero of Men. Besides making the error of presenting their opinion about Gustaf as a fact, Gametrailers also uses shaky reasoning to show The Minish Cap as being first. They imply that becuase the Picori gave their sword to the Hero of Men, and not the Hero of Time, or Ocarina of Time Link, The Minish Cap likely precedes Ocarina of Time. 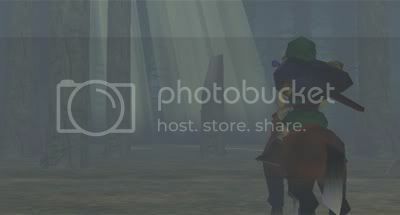 They disregard the fact that there is more than one Link, and only one of them is known as the Hero of Time. The fact that Ocarina of Time Link is not mentioned in The Minish Cap‘s backstory is far from proof of timeline placement. Gametrailers suggest that Link tries to sail home, thus setting the stage for Link’s Awakening, but the ending of Majora’s Mask shows him going home on Epona, his horse. He is shown in what appears to be the Lost Woods of Hyrule. “Though you fulfilled the Hyrulian prophecy of the Legendary Hero and destroyed the evil tyrant Ganon, the land of Hyrule enjoyed only a precarious peace. At this point in the timeline, Ganon has never been killed. How can the people of Hyrule be worried about the threats arising from Ganon’s ashes if he’s never been killed? For this reason, Link’s Awakening must follow a game in which Ganon is dead. From here, Gametrailers progresses to the original Legend of Zelda, and its sequel, Adventure of Link. When explaining Adventure of Link‘s manual, Gametrailers makes some critical mistakes. The main problem here is that Gametrailers omitted part of the story. The actual legend also states that before the King died, he hid the Triforce of Courage in the Great Palace because he could find no one worthy of the Triforce. InAdventure of Link, the Triforce of Courage is still hidden in the Great Palace, and has been since the King put it there. Thus, no games where the Triforce of Courage is outside the Great Palace can happen in between the actual Legend and the game Legend of Zelda. This conflicts with the with the Gametrailers timeline, because they say the actual Legend happened prior to The Minish Cap directly, and Ocarina of Time more importantly. In Ocarina of Time, the Triforce of Courage is resting in the Sacred Realm at the game’s beginning, and not in the Great Palace. A progression from the actual Legend to Ocarina of Time to the Legend of Zelda video game is not possible. Next, there is a bit of confusion as to which game they are talking about. 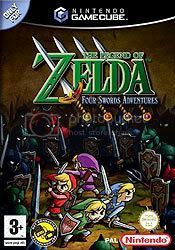 The narrator refers to the game as both “Four Swords” and “Four Swords Adventure” at different times. These are two different games, but only one is described in the Gametrailers timeline. The image shown, and the description of the game match Four Swords Adventures for the Gamecube. Gametrailers apparently decided to leave out Four Swords for the Gameboy Advance. Next, they have A Link to the Past. This game’s backstory tells of how the Sacred Realm became evil, and was sealed off. Throughout the game, we learn from various sources that Ganon is sealed in the Sacred Realm. The tale of how this all happened is known as the Imprisoning War, or Seal War. Gametrailers believes the Imprisoning War to be the events of the Adult Side, or Hyrule B side, of Ocarina of Time, yet they place A Link to the Past in Hyrule A. So Gametrailers places the backstory of [i]A Link to the Past in Hyrule B, but the actual game in Hyrule A. The concept of the story being passed down as a legend, but not a historical fact is possible, but right after that is where Gametrailers uses poor logic. Regardless of how the “legend” of the Imprisoning War was told, there has to be a seal on the Sacred Realm for A Link to the Past to happen, because Ganon is truly sealed away in the game. While the story may happen in a separate timeline, the actual sealing cannot. If no seal was cast in Hyrule A, then how is Ganon trapped in A Link to the Past? 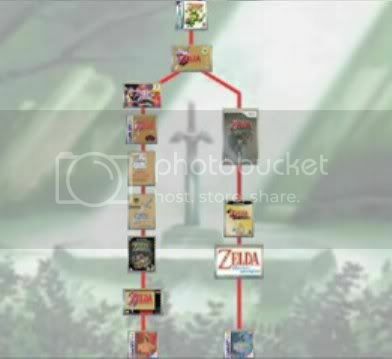 Any timeline theory that puts A Link to the Past in Hyrule A must give an explanation for how the Sacred Realm was sealed, and the Gametrailers Retrospective fails to do that. Next, Gametrailers suggests a progression from the adult events of Ocarina of Time to Wind Waker, the first game in Hyrule B. This works just fine. After this, Gametrailers gives their thoughts on Oracle of Seasons and Oracle of Ages. If you beat one game, and then play the linked version of the other, a family moves from Holodrum to Labrynna, or vice versa, depending on which order you played the games in. The story of the skull pirates shows that Holodrum and Labrynna are connected via the sea. The captain will recognize you if you play the linked game. There are many characters in the games who can tell you secrets to tell people in the other game. None of this is possible unless the games are on the same timeline, and in close proximity. Also, while most theorists only consider the final product as a source of good proof for a timeline, it’s interesting to note that originally there were plans for three Oracle games. The third one had to be dropped because of complications with the linking system. This doesn’t prove that the games are on the same timeline, but it does show that they were not developed to prove a split. Finally, Gametrailers deals with the two newest Zelda titles, Phantom Hourglass and Twilight Princess, and their places in the timeline. Phantom Hourglass is a direct sequel to Wind Waker, and is placed as such in the Gametrailers timeline. “Interviewer: When does Twilight Princess take place? Aonuma: The Wind Waker is parallel. In Ocarina of Time, Link flew seven years in time, he beat Ganon and went back to being a kid, remember? Twilight Princess takes place in the world of Ocarina of Time, a hundred and something years after the peace returned to kid Link’s time. In the last scene of Ocarina of Time, kids Link and Zelda have a little talk, and as a consequence of that talk, their relationship with Ganon takes a whole new direction. In the middle of this game [Twilight Princess], there’s a scene showing Ganon’s execution. Link and Zelda left him be and he then did something outrageous, so it was decided that he should be executed. This time, Aonuma gave a detailed explanation for where Twilight Princess goes, and how it fits there. If this is to be believed, then Twilight Princess doesn’t take place in Hyrule B, but in Hyrule A sometime after Majora’s Mask. Some people discredit director quotes, because the directors have been known to change their minds. Disregarding director quotes, can Twilight Princess go where Gametrailers says it belongs? In the backstory of Wind Waker, we learn that Ganon escaped the seal cast on him, and no one could stop him, so the goddesses flooded Hyrule. In Twilight Princess, Ganondorf is not sealed in the Sacred Realm, and he is killed in the end. In both Ocarina of Time and Wind Waker, Ganondorf seems obsessed with uniting the three people with Triforce pieces so that he can obtain the whole Triforce. In Twilight Princess, all three holders of Triforce pieces are together, and Ganondorf doesn’t make any attempts to steal the other two pieces. He never even mentions the Triforce in Twilight Princess. If Twilight Princess really takes place in between Ocarina of Time and Wind Waker, he would recognize it as the Blade of Evil’s Bane that defeated him once. On the adult side of Ocarina of Time, Link awakens the Seven Sages to help seal away Ganon. These sages are composed of different races, and they appear on stained glass windows in Wind Waker as well. The sages we see in Twilight Princess are all seemingly the same race, and are not the same as the ones in Ocarina of Time and Wind Waker. In conclusion, though we do not know the true timeline, plausible timelines can be built using facts. Gametrailers timeline is very well presented and it is often readily accepted by new theorists, but it lacks the facts and logic that every good timeline should have.